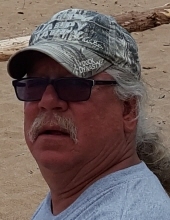 Dennis Dale Berdal age 62, a 6-year resident of Eagle River WI and formally of Wausau, WI passed away Tuesday April 9, 2019. Dennis was born on September 17, 1956 in Stanley WI to Edward and June (Johnson) Berdal. Dennis married Pam Ebben on June 5, 1976. They were married for 43 years. Dennis worked for Grebe’s Ace Hardware prior to becoming a Deputy for the Marathon County Sheriff’s Department for 23 years. He was a volunteer for Ascension Eagle River Hospital and helped with the St Theresa’s Parish Festival and serving funeral luncheons.Dennis enjoyed bird watching and putzing outside. He lived for hunting for that trophy buck. His greatest joy was spending time on the pontoon fishing with Pam. He also enjoyed teaching the grandchildren how to hunt, fish and drive the pontoon. He will be remembered for his unique sense of humor and storytelling. He is survived by his wife Pam, Eagle River, his children Ryan (Connie) Weston, Rebecca (Brian) Roeder, Stoughton, Dennis (Eva Motley) Charlotte NC; grandchildren, Jacob (JJ) and McKenna Berdal, Marcus, Mitchell, Miller and Meric Roeder, Justis, Jamison and Presley Berdal; siblings, Kitty Kenny, Randy (Judy), Rod (Donna). Sister-in-laws, Debbie (Wayne) Seeger, Jane (Dan) Kramer and Nancy (Joel) Cance. Besides his parents, he was preceded in death by his brother, Barry, brother-in-law, Terry Kenny and infant sister Millie; Mother and Father- in-law Cliff and Katie Ebben. Mass will be held at 11:00 am Wednesday, April 17, 2019 at St Theresa Catholic Church, 1701 Superior Street Three Lakes, WI. With Fr. Allam will officiating. Visitation will be held from 10:00 a.m. until time of mass. In lieu of flowers, donations can be made to a Humane Society of your choice or St Theresa’s Raise Us Up campaign. Mid-Wisconsin Cremation Society is assisting the family. Online condolences can be made at www.honorone.com. To send flowers or a remembrance gift to the family of Dennis Dale Berdal, please visit our Tribute Store. "Email Address" would like to share the life celebration of Dennis Dale Berdal. Click on the "link" to go to share a favorite memory or leave a condolence message for the family.